The current MSN stock screener has a hard act to follow. MSN Deluxe was one of the premier stock screening tools even though it was free. The Deluxe MSN stock screener was retired in November, 2009. The rationale for the change was that MSN Deluxe ran only on Internet Explorer. The new screener does not have that limitation. This pretty much eliminates this screener from being an elite free stock screener. Since Deluxe was a premium stock screening tool, both free and fee-based alternatives are identified after this review. Although the MSN stock screener doesn't seem to have much value, it may be useful to some. When you access MSN Money, the default settings for the screen are shown at the right. 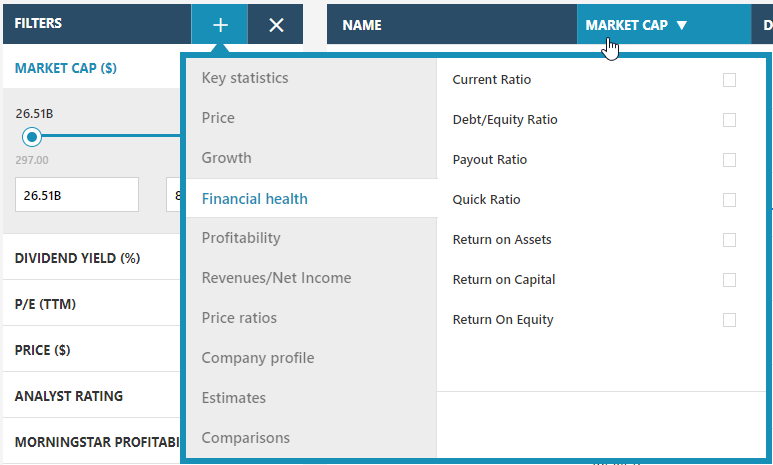 Under each category, there may be a slider to adjust the acceptable range for the criteria (e.g., market cap) or a checkbox for one or more items in the list (e.g., a MorningStar grade). Although you can create your own screen, seven pre-built screens are provided. Perhaps the most interesting feature (the one most likely to make the MSN stock screener useful) is the selection of almost 50 unique world-wide markets. Access to the MorningStar grades is a nice feature but the same feature is available in other stock screening tools. Additional criteria are accessed using the "+" button next to the FILTER heading. Once selected, the list of additional criteria is displayed as shown below. Each highlighted section displays the list of related criteria. Notice you will not know if these are quarterly, trailing 12 month or annual based. Basic valuation ratios are available in the Price ratio selection. Criteria are not documented. So, not only is the list limited, in many cases you do not know how the data point is generated. Even worse, you cannot save any modifications you make although you can save passing companies to a portfolio. Saving in a portfolio requires creating an account at MSN Money (free). Unless you have a desperate need to use MSN Money, it is reasonable to consider other screeners. One option - consider any screener offered by your online broker. FinViz - a fee-based version is also available. Requires registration. StockRover - MorningStar grades are available in free version. A fee-based version is also available. Requires registration. Zacks - Zacks rank is available. Requires registration and can be accessed on both Zacks and NASDAQ sites. We have compiled a list of free stock screening tools. Several have detailed reviews. The rationale for selection as "best" is detailed. One of these may work for you. If you know of other free screeners please contact us so we can share the information with everyone. AAII Stock Investor Pro - Offline tool updated daily for downloading. Analyst buy/sell/hold recommendations may be the only missing piece of data. Custom fields are saved by name. Can screen against custom stock universes. Back-testing is cumbersome, but possible. No proprietary data. MorningStar Premium - Lots of data as well as the Morningstar grades and rating system. No custom calculations can be created. Excellent portfolio manager. Portfolio123 - Stock screening on steroids. Does everything well. Includes back-testing, multi-factor ranking and a simulator with separate buy and sell rules. Portfolio management automated within live models. Research Wizard - Extensive data set with robust back-testing capabilities. Custom fields can be created but not named. Telephone support. Proprietary Zacks ranks. StockRover Premium - Adult version of free product. MorningStar grades are included. Ranking with weighted screening criteria. Portfolio manager and excellent fundamental and technical presentation of companies. UncleStock - Robust stock screening tool with several multi-factor ranking systems and back-testing. Like the MSN stock screener, a large selection of world-wide markets is offered. VectorVest - Mix of fundamental and and proprietary indicators. Can screen against custom stock universes. Much of the fundamental data in packaged as proprietary rankings. Back-testing (suffers from survivorship bias) and simulation capabilities. Custom fields can be created and named. Worden Telechart - TA oriented system with many fundamental fields available for screening. Can screen against custom stock universes. Proprietary technical indicators. Back-testing is available as an add-on. Custom fields can be created and named. Zacks Premium - Adult version of free screener. Lots of data as well as the proprietary Zacks rating system. No custom calculations can be created. Access from Zacks or NASDAQ sites.